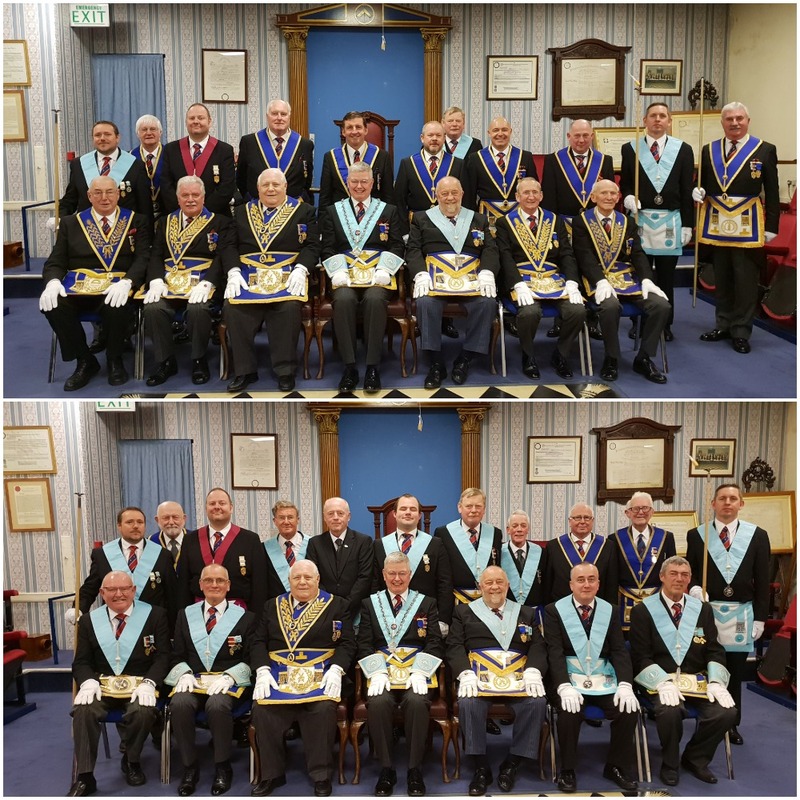 On the 22nd November over 50 Brethren gathered at Blackburn Masonic Rooms and The Lodge of Perseverance No 345, to celebrate 50 years in Freemasonry of WBro David William George Bell PProvGSwdB. Once the Lodge business had been concluded, WBro Andrew Taylor as the Provincial Grand Director of Ceremonies, directed a Delegation of Grand and Acting Officers of the year led by our Past Provincial Deputy Grand Master, VWBro Derek Thornhill into the Lodge. Once seated and the salutations completed, VWBro Thornhill occupies the Master’s Chair. Prior to the celebration, the Lodge Secretary WBro Jim Fallow read a very sincere and amusing letter from the new Deputy Provincial Grand Master WBro John Farrington, wishing VWBro Thornhill his very best for the evenings proceedings and congratulating WBro Bell on his special anniversary. WBro Jim Fallow was directed to read the minutes from the Initiation meeting of November 1968 after which WBro Brian Metcalfe read his personal tribute to WBro Bell. The full tribute full can be found by clicking HERE. VWBro Thornhill recounted events that has happened in the field of current affairs, sport and entertainment from 50 years ago in 1968, his impromptu quiz had the Brethren wracking their brains and in true VWBro Thornhill style he had everyone singing the chorus from Mary Hopkins’s 1968 hit ‘Those were the days My Friend’. Following the trip down memory lane, he then presented WBro Bell with his personal letter and Illuminated Certificate signed by the Provincial Grand Master RWBro Sir David Trippier. WBro Bell was then perambulated around the Lodge to the acclaim of the Brethren. 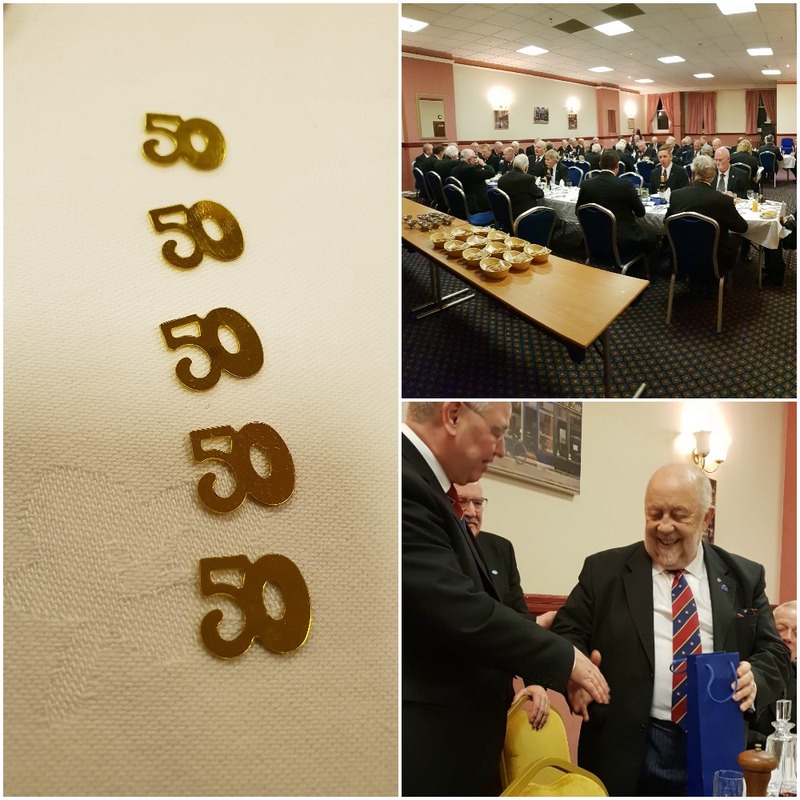 The celebration concluded with the presentation of the 50th lapel pin from the District which was delivered by our Deputy Chairman WBro Russell Harwood. Before the delegation retired to the festive board, the Worshipful Master WBro Proctor presented VWBro Thornhill with a cheque for £250 made out to the ELMC. The Festive Board saw the Brethren enjoy a sumptuous 5 course dinner that replicated the meal at David’s Initiation meeting 50 years ago. The toast to WBro Bell was given by WBro Ronald Barham. In his moving tribute, he spoke sensitively about how David had helped him over his personal tragedy of losing his wife by getting him back out and about and back into Masonry. The response from David was delivered in a very sincere and at times emotional manner. He began by presenting VWBroThornhill with a token of thanks which was gratefully received. He went on to speak fondly about his membership of Cathedral Lodge No. 7814, and how he loved the Lodge of Perseverance No. 345 as his Father and Grandfather had been members. He made reference to how his initiation was to be completed by his Father who was so emotional he couldn’t complete the ceremony without the assistance of the Senior Warden at the time. The Worshipful Master presented David with a decanter on behalf of the Lodge which he was delighted to accept. The Brethren departed having witnessed a touching 50th celebration , and everyone looks forward to David’s 60th celebration in 10 years time.